Let’s get one thing straight: Oscar Isaac is not a Latino actor. He is one of the most in-demand actors in Hollywood who happens to be Latino — and this year will forever be known as the one in which he went from indie favorite to that guy you have no excuse to not know. 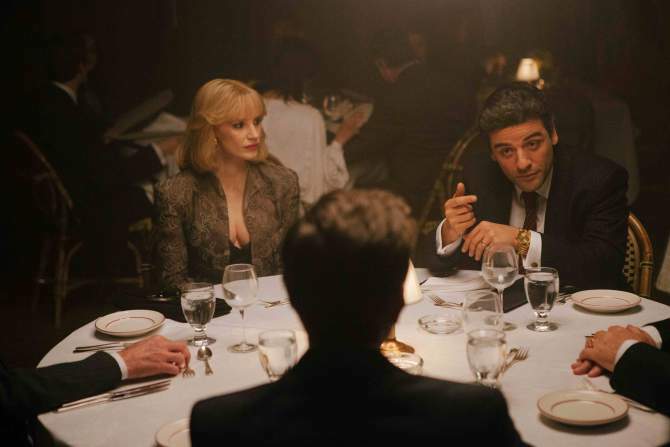 Isaac kicks off 2015 in style with “A Most Violent Year,” a drama from writer-director J.C. Chandor set in New York City during the nightmarish winter of 1981. Statistically, the title is no joke: there were 1,826 murders and 120,000 robberies that year (a record at the time). His character, Abel Morales, is an immigrant who escapes his violent past in Colombia and achieves the ever-elusive American Dream through sheer hard work. But with his thriving heating-oil business under attack from competitors who behave like thugs, Abel is torn between staying true to his principles and resorting to violence in order to protect what’s his and eventually build an empire, all while the DA (David Oyelowo) is on his tail. If Isaac gives off a Michael Corleone vibe in the film it’s not a coincidence. As he tells it, Francis Ford Coppola and Sidney Lumet films are ingrained in his subconscious, allowing him to portray Abel with an understated elegance reminiscent of some of those classic characters from the ’70s and ’80s. Still, it was important not to directly reference them in order to create something new and fresh, says Isaac. In fact, Abel’s nationality is never overtly established in the movie, although he does share a memorable scene with Colombian actress Catalina Sandino Moreno in which they both speak Spanish. Also sharing the screen with Isaac is his friend and fellow Juilliard alum Jessica Chastain as his ruthless, business savvy wife who isn’t afraid to scheme for the sake of the family. She’s the realist to Abel’s dreamer, and the two share a rare on-screen chemistry. Isaac took time out of his busy shooting schedule to chat with us about “A Most Violent Year” and a couple of upcoming small projects, “Star Wars: The Force Awakens” and “X-Men: Apocalypse.” Maybe you’ve heard of them? Later this year, Isaac will play former Yonkers mayor Nicholas Wasicsko in the Paul Haggis-directed ’80s desegregation saga “Show Me a Hero” for HBO. The mini-series is based on the 1999 book by former New York Times writer Lisa Belkin. Episode VII of “Star Wars,” in which he plays an X-Wing pilot named Poe Dameron, arrives December 18, and a few months later, in May 2016, we’ll see him as the titular villain in Bryan Singer’s next X-Men film, playing a mutant who can control the molecules in his body. And that’s just him getting warmed up. My first question is about what isn’t overtly explained in the movie. Can you tell me a little bit about what you and the director discussed would be Abel’s background/context? His past is a mystery and I think purposefully so. Abel is someone who believes in this ideal of a self-made man, he’s come to this country to recreate himself and he has severed his past. But as an actor you want to know the context of his life and where he’s coming from. Emotionally, it influences everything. I had interesting, difficult questions like, why is he so much against violence? Why does he not want guns? Where does his moral compass come from? And that led me to think, well, when did he come to this country? J.C. and I discussed that and said, ok so, if he came here when he was 7 years old then he would’ve left whatever country he’s from in the late ’50s. So I did a little research into what was happening around that time in Central and South America and the civil war that was happening in Colombia, called “La Violencia,” and I thought, well that’s perfect. He left that country because of the violence, now he’s in this new country to start all over again and they’re trying to get him to succumb to violence and that helped ground emotionally where that was coming from. And if that was going to be the choice then the next step would be to think about the accent not only in English but in Spanish and try to put some of that flavor in the thing. Abel’s workers speak to him in Spanish, but he responds in English, and insists that they learn the language. That’s very common of immigrants of that era, that assimilation mentality. Yeah it’s very different from the idea now, which is much more inclusive of people’s heritage and that’s part of being an American but this has a little more sense of no, this is a new place, this is a new world, you’re not Hispanic, you’re a Capitalist, this is the system that you’re in. He’s a bit of an anti-hero in that way. He does try to take away that individuality not only of himself but of his workers because the goal is to eventually do business with politicians and the mayor and people at the highest levels. They want to dismiss him as just some Latin thug with a gun but he refuses to do that and I think that’s part of the dilemma. Were there elements of your own family that you brought to this? Not in any kind of direct way that I can say, but there’s definitely something of the memory of what one’s grandfather represents, even though my grandfather was a very kind man. He was Guatemalan, he had his own mechanics shop but there’s something more about the stature of the person and the quietness of the character that I thought of. You obviously have played lots of parts that are not dependent on your ethnicity, but what does it mean to you when you can play a Latino in a movie as good as this? I think it was a great character, a very unclichéd look at a Latin American man and I can’t really remember the last time that we’ve seen a movie that’s in English, that treats the main character that is a Latin American man in this way. It’s so individual and idiosyncratic and that is just one aspect of the character. it’s an incredibly important one but the whole movie isn’t about defining that aspect of him. It’s about more universal things and I think that’s just so much more interesting. I really appreciated that J.C. decided to make a character study about a man like this. He’s not all good, he’s not trying to create sympathy. In some ways he goes against that idea. How important is it for you to be able to transcend labels as an artist? People are always seeking to define artists and particularly actors because you are playing these different roles and sometimes as an artist you kind of want to be a citizen of the world. You’re showing what it is to be a human being from this background, from this place, all those things, so I think once someone is completely defined it dies a little bit. I was actually going by Oscar Isaac before I went to Juilliard because I grew up in Miami where Oscar Hernandez is an incredibly common name. I was going to castings and there were like 3 other Oscar Hernandez [laughs]. I needed to pop out a little bit. How excited are you to play a comic book villain in a movie as big as “X-Men”? I did “Sucker Punch” and that was a big CG, larger-than-life character and then I also played King John in “Robin Hood,” who was a very old-school type of villain. But definitely the universes are more widely known and I have more of a history with them as well. X Factor was the first comic book character that I ever collected and that’s the first appearance of Apocalypse in 1986. I was very into that comic book character and I knew all about him so when this came around I was so excited about playing this character. How do you approach these larger-than-life characters? I do the exact same work. In fact, sometimes you do even more work [on these movies] because anything that is made by human beings is about human beings, by the nature of it. It’s never about aliens or superheroes or robots, it’s always about something about the experience of being alive right now. So I thought about the woman, Louise Simonson, who created Apocalypse, [and wondered] what was she exploring when she made this character that encompasses the second coming of the end of the world and the revelation? Why? What was it that she was trying to express? And then you go back to that point. I know ‘Star Wars’ is shrouded in secrecy, but what can you tell us about your preparation for that? I thought: Ok, I’m playing the character that I’m playing that I can’t talk about [laughs] but I say, what is it about war? This is all about wars; it’s called “Wars.” So you read about the ecstasy of war and what happens to people in war and what does it mean to be a warrior — a spiritual warrior. So that’s what I’m interested in — the expressive part, no matter what universe it is.